The Ultimate Goal of a Robo-Advisor, What is it? YOU ARE HERE:Home » Robo-Advisor Strategy » What Is the Ultimate Goal of a Robo-Advisor? 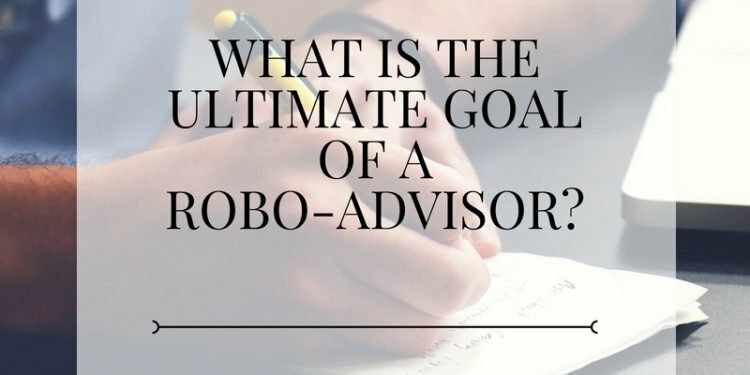 What Is the Ultimate Goal of a Robo-Advisor? 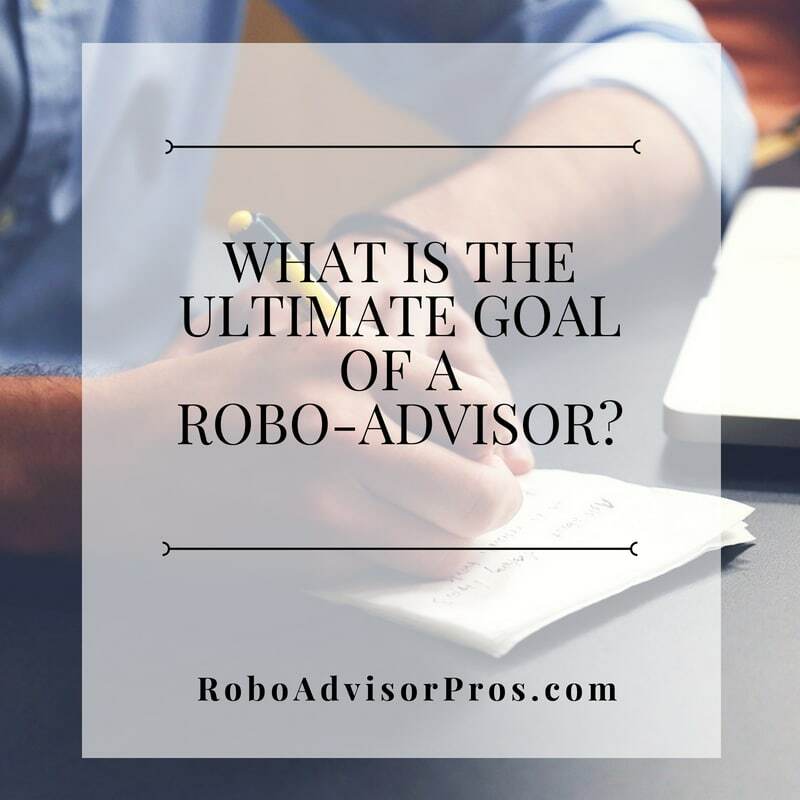 Many people who have never heard of robo-advisors have one question in mind: “what is the ultimate goal of a robo-advisor?” Maybe you understand that a robo-advisor has something to do with investing. But what else does a robo-advisor do and how does it help with investing? For starters, any investment decision you make should be well-informed and make sense based on your investing style, financial situation, and goals. So, do the goals of a robo-advisor align with your own? The way I see it, the ultimate goal of a robo-advisor is to help you simplify the way you build wealth! How Do Robo-Advisors Meet This Goal? Now, some robo-advisors have different goals than others depending on their target clientele. As usual, you need to do your research before choosing which robo-advisor to use—if you decide to use one at all. For help choosing a robo-advisor, download the robo-advisor comparison chart. However, using a robo-advisor has many perks; robo-advisors were created in response to our changing investing needs and lifestyles, and take advantage of technology that makes investing much easier. For that reason, the ultimate goal of many robo-advisors boils down to providing clients with simple ways to build wealth through investing. Robo-advisors are specifically designed to compete with traditional financial advisors and to give their users an advantage in the market. Algorithms help the computer make decisions about buying, selling, and rebalancing stocks so that users have a well-rounded portfolio at all times. Best of all, robo-advisors are usually much cheaper (or free) than human financial advisors due to the low overhead required to maintain a robo-advising platform. That being said, you can also find actively managed robo-advisors to give you a human contact if that is something that is important to you. The low robo-advisory fees mean that more of your money goes towards investing. Click to find out how robo-advisors work. Robo-advisors are designed with the user experience in mind, so they offer a variety of investment options for the absolute beginner all the way to veteran investors. The key to making good use of a robo-advisor’s features is to know what you value. Do you want the robo-advisor to make the hard decisions for you by choosing your investments? Do you want to maintain a specific portfolio balance without needing to look at your investments every few days? Do you have investments or retirement funds in multiple places and are looking for a way to manage everything in one place? Are you a new investor seeking an easy way to begin investing? If the answer to any of these questions is “yes,” then the ultimate goal of a robo-advisor aligns with your goals! If the ultimate goal of a robo-advisor is to simplify the investing experience, robo’s with premade portfolios definitely fit the bill. Bonus; Are Robo-Advisors a Scam? Robo-advisors with these features make investing remarkably easy by offering premade portfolios of investments that match your investing style and risk tolerance. These robo-advisors typically use questionnaires to better learn about your risk tolerance and goals, before recommending certain portfolios. Some even let you choose to invest in stocks or businesses that meet their ethical standards. Yes, you can make positive change in the world while simultaneously building wealth! While some people might argue that this takes away from a user’s ability to customize their investments, that would be exactly the point– it can’t get much simpler than letting the technology work for you. Although, if you prefer to customize your own investments, M1Finance Robo-advisor offers that option. Watching stocks rise and fall or deciding how to compensate for a loss is not for the faint of heart, and those who are new to investing may find the art of balancing an investment portfolio a bit overwhelming. Whether the idea of carefully monitoring your portfolio for balance is nerve-wracking or you just have better things to do, a robo-advisor can help here. The ultimate goal of a robo-advisor is to support your investing decisions and to help you make the best investment choices. And, rebalancing your investments back to your preferred percentages is one place where robo-advisors shine. Most robo-advisors come with this feature, because it really is a great way to simplify the investing process for many individuals—investing newbies or not. This might be the greatest demonstration of the ultimate goal of a robo-advisor. If you’ve had multiple jobs, you might have retirement funds sitting in multiple accounts. Those who are fortunate might have stocks purchased in their names or through their employers. Whatever your situation, having your investments all in one place is a surefire way to simplify your investing strategy and help you build wealth without a headache. Keeping everything in one place will require a special sort of robo-advisor, and the one you choose depends largely on where your investments reside. SigFig, for example, can track and manage any investments held in TD Ameritrade, Fidelity, or Schwab. Best of all, SigFig is one of our top 6 low-fee robo-advisors. In short, simplifying your investment options so you can build wealth without the hassle is the ultimate goal of a robo-advisor. Robo-advisors achieve this goal in different ways depending on the robo itself, but some ways include offering premade investment portfolios, automatically rebalancing portfolios based on the market, and giving users the option to view all their investments in one place. Everyone can benefit from a bit more simplicity in their daily lives, and your investing choices are no different. By eliminating the more complex, time consuming aspects of working with a human financial advisor, you might find you have more time to do the other things that are important to you.